Summary: Natalie should be on top of the world dating Jeremy. He's totally perfect by everyone's standards. But the seemingly flawless couple have been dating since freshman year, and now Natalie fears the spark may be fizzling. Being such an "expert" in love, Natalie gets coaxed into writing a romance column, and soon she finds spending time with her editor, Matt, to be way worth the work. There's just one catch. Matt is Jeremy's best friend, and dumping your boyfriend for his closest friend is just wrong...right? 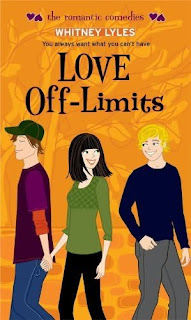 My Thoughts: Love Off-Limits is a cute fast fun read. We meet Natalie who is dating Jeremy. They have been together for a few years. She loves him but feels like their relationship just isn't what it used to be, though she will always be his friend. She realizes that she has feelings for his best friend Matt and he feels the same way about her. They beat around the bush for a while but end up doing "something" with each other. We also meet her friends and I particularly liked them and their "issues." I can't say much more about it without giving away the whole plot. I really liked the characters and from the get go I was voting for Matt!!!! Overall: This was a cute book. It is predictable on some levels but still enjoyable. I enjoy all the Simon Romantic Comedies! Cover: I like covers that involve actual humans more but its still a cute cover. All the romantic comedies have these kind of covers so its expected. Cute.